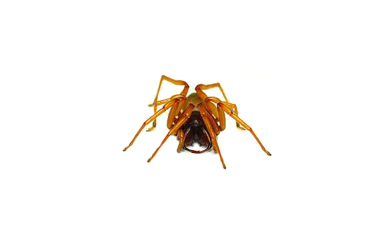 The Woodlouse Hunter Spider’s distinctive red body and makes it particularly distinguishable from other spiders. They are found outdoors under rocks and logs near buildings where they hunt for woodlice (pill bugs and sow bugs). They prefer damp, rotting vegetation and wood, and cannot survive for long in dry conditions. They wander into basements, under stones and boards, window ledges, and areas with rotting wood. Maintaining a dry and dust-free environment will minimize the spider infestation by eradicating their food source. Also sealing any outside cracks and crevices is important.